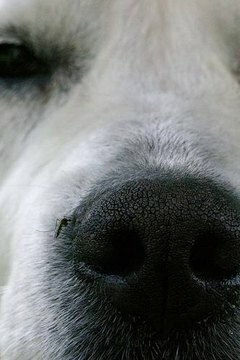 A mosquito bites an infected dog that just happens to have heartworm larvae in the correct stage to enter the mosquito's mouth. These are microfilaria, and they develop in the mosquito for the next ten to 48 days into infective larvae. Then the larvae travel to the mosquito's mouth parts, enabling it to infect the next dog it bites. During the bite, the larvae enter the dog's skin. Pets who live outdoors and are male are much more prone to heartworm infection than pets who live indoors. The infected larvae burrow deeper into the dog's skin and change their form. Eventually they move into the dog's veins until they reach the heart. Adult worms finally appear in the heart in three to four months, and they are able to live there for five years growing to 12 inches long. The males and females mate, producing offspring of microfilaria in the millions. They are able to live for up to seven years in the small blood vessels of most infected dogs. This eventually causes reduced blood flow, resulting in liver and lung problems. The most typical age for diagnosis is between three and eight years. A single dog's heart can house between 40 and 250 adult heartworms. What Are the Symptoms of Heartworms Disease? While a dog may not display symptoms of advanced heartworm disease, it is common for a dog to cough, have shortness of breath, faint following exercise, easily tire and lose weight and appetite. Other signs include nervousness, anemia, jaundice, a coat in poor condition, abdominal swelling and blood in the stool. As the disease advances, the dog's ribs will appear prominent and its chest will bulge, finally resulting in blood clotting, heart failure and death. A common test to diagnose dogs is an antigen detection test. A blood test that detects microfilaria is also used. If your dog's veterinarian can detect microfilaria from a smear of blood under a microscope, then your dog has heartworms in its heart as well. Treating heartworms can be dangerous for the dog, and if in advanced stages, it can result in death. Before beginning treatment, the dog has to be healthy, so medication may be needed to strengthen the heart before treatment. The treatment usually involves two steps. First, a medication is given to kill adult heartworms. During this treatment, the dog must be kept quiet and still for two weeks to avoid a heart attack. If the dog survives for the next three to six weeks, it will be given a medication to kill the microfilaria. Three weeks later the dog will have a blood test to see if the heartworms are gone. If the test is negative, the dog should start on a monthly program to prevent reinfection.